The Macy's parade in New York City might be more famous, but Philadelphians can lay claim to having the oldest Thanksgiving parade in the country, the 6ABC Dunkin' Donuts Thanksgiving Day Parade. 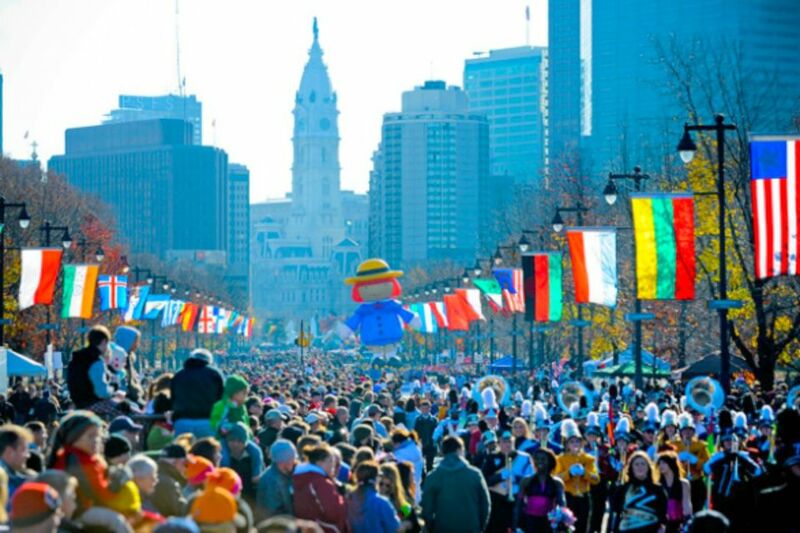 The City of Brotherly Love has hosted a holiday parade since 1919. Millions of spectators line the 1.4-mile parade route to see marching bands, dance troupes, Santa Claus, elaborate floats and floating balloons—Curious George, Madeline, My Little Pony, Dr. Seuss characters and more—flying high above the Benjamin Franklin Parkway in downtown Philadelphia and ending in front of the Philadelphia Museum of Art. Millions more watch it on TV as part of their holiday ritual. Where: On Thanksgiving Day, the parade route begins at 20th Street and JFK Boulevard. It travels east on JFK then turns left on 16th Street and left again on Arch Street and up the Benjamin Franklin Parkway to the Philadelphia Museum of Art. Arrive early. While the parade won't kick off until 8:30 am, crowds start gathering along the route as early as 5:30 am. Tip: Bring folding stools or chairs to make the wait a bit more comfortable. Dress for the weather. Philly can be chilly in late November. From the time when you pick out your viewing spot until the end of the parade, you could be standing outside for five hours or more. Be sure to dress warmly and make sure kids have hats and mittens. Pack essentials. Don't forget your camera, snacks, perhaps an extra sweater, and a healthy dose of patience. It'll be crowded, so prepare to roll with it. Pick a spot wisely. Choose a viewing location near the southern end of Benjamin Franklin Parkway. Once the parade starts, it can take 90 minutes for the whole procession to pass by. If you're situated near the beginning of the route, you could be finished before 11 am. It's also a good idea to position yourself near a coffee shop or department store, where you can nip in for a bathroom break if needed. For younger kids, this can be crucial. JFK Plaza and Love Park: Soon after the parade moves east from its start at 20th and JFK, Love Park offers a great view of the floats and characters. Try to arrive early and stake out a spot on an elevated section of the park above the fountain. Sister Cities Park: This picturesque public park in the Center City District offers a spacious green space to set out a blanket and watch the parade pass by. Logan Circle: The parade route passes on the south side of this famous circle, where the iconic Swann Memorial Fountain in the center offers seating for the parade. Franklin Institute: The grand steps of the Franklin Institute and the sidewalk down below it are excellent parade-watching vantage points. Benjamin Franklin Parkway: Anywhere along the parkway will give you up-close views of the parade. Get there early to claim a spot. A.C. Moore Parade Zone: A seasonal pop-up park at Eakins Oval hosts the A.C. Moore Parade Zone featuring live music, warm beverages and family fun fall morning long on Thanksgiving. It's one of the best spots to view the end of the parade in front of the Philadelphia Museum of Art. Philadelphia Museum of Art: The parade comes to a close in front of this museum, whose famous steps provide a spectacular view of the floats, balloons and performances. Know when to bail. Seeing part of the parade is better than nothing. If it's very cold or the kids are getting cranky, there's no shame in ditching out before the last float passes by. B.Y.O.B. (Bring Your Own Basket) to these Philly-wide Easter egg hunts.